Yesterday, I came across this reminder that it was the anniversary of the Bloody Sunday from Rep. John Lewis on Twitter. I wondered how I might instill this idea in my students? The idea of inspiring students to get in "good trouble" is one of my guiding principles as an educator. But, my next thought was of how often I contradict this philosophy with my words and actions. The problem is not the lessons I teach. The problem is not the way I speak and act when things are going well. The problem arises when I am tired, frustrated, and upset. So in expressing a commitment time and again to rethink the way I use my power as an adult and teacher, I often thwart my own efforts. I wonder than, how can I better align my principles with my words and actions? I teach resistance, but at times I demand compliance. I know that some of this is a reaction to stress. As usual, I am feeling a pressure of standardized tests. And this year, it appears as though the decision to close our school may be made on the basis of these scores. Added to that is the challenge of teaching kids with various social-emotional needs. But this is an explanation, not an excuse. And these are the facts of a choice I made: teaching in a public school in Central Harlem. 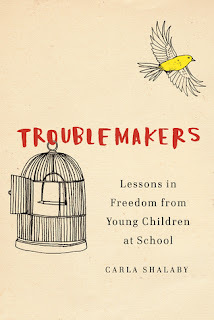 A recent memory shows the struggles I think I face truly teaching kids to make "good trouble." I was debating with a student who was in my classroom to complete missing homework. "Why do we even need homework?" he asked. I gave him a genuine answer, "It provides additional practice, it shows your family what you're learning, and it prepares you for the work load you'll have in middle school." He was unconvinced. I explained to him that I respected his position, and that he was entitled to boycott homework. But civil disobedience means accepting consequences as well. When Dr. King broke the law, I said, he went to jail. The teachable moment we had though is somewhat incomplete. If my student is Dr. King in this case, then am I not admitting the injustice of homework? Aren't I also standing in the role of Bull Connor in this analogy? Furthermore, if I continue to give homework, in spite of the analogy, am I not teaching him that good trouble is pointless? Part of the contradiction illustrated by this incident can be chalked up to the inherent challenge of teaching resistance as an authority figure, and as an agent of the state. But I think it also demonstrates the need for me to reflect on the individual policies in my classroom - consequences and homework in particular - that teach the value of compliance over the value of "good trouble." Overall, I think my kids know I support "good trouble." I think my teaching generally reflects that. But I'd like to be more consistent with my words and actions. I want to make sure I support "good trouble" in action, and not only in theory. I want to affirm my students' ability to cause "good trouble" even in moments when it may challenge my authority. We certainly need a lot more good trouble in the world, and I don't want to be the reason we lack it.